Well, after an intensive few weeks of creating and making, I finished what I needed for two exhibitions - one down in PA for Moss Rehab and the other for the League of NH Craftsmen gallery. 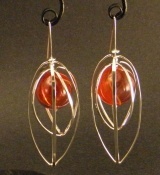 All the earrings and necklace have been shipped off and being set up in the All about Art at Moss Rehab. The purse and lamp are at League of NH Craftsmen gallery in the upcoming show called "Giving Back". I've been in a purse and lamp mood this year and since I'm tired of flatware, and want to work slightly bigger, lamps and purses fit the bill. I have a need to make vessels, but to be realistic, who's going to want to spend $500 on a hand-raised copper bowl with a base, or handmade bowls, vases, etc. On the other hand, women in general love handbags, and for some reason, I'm totally indifferent to purses. Not my cup of tea - I joke my purse is a toolbox. So, I thought, why not make purses - they are a vessel, but with a handle and are made to be carried around. That way, I satisfy my need to make vessels and have something functional that people can relate to better. I hope it will make me understand what is so special about handbags/purses. I generally make a rigid form out of heavy nickel wire, and then either weave or knit a "skin" that wraps around the framework and provides the body of purse. This is the 3rd purse I've made, but the first one that has a knitted body. I made several frames, but only one is finished. This purse is called "A Touch of Paris". 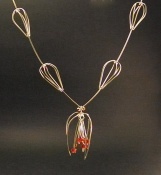 I used black and hemalite-colored copper wire and then switched to silverplated copper wire. That way I have a subtle, French shading of black to white and then back to black. The purse has a double ruffle that adds flair to the purse, and the handle is also quite dramatic in the ball on one end and spiral on other end. I love this purse and it's starting to make me understand the appeal of a great handbag. The next purse is more flirty in the asymmetrical handle and I am going to use magneta color wire to make it more dramatic. I think I will call it "Flirty" for the handle is a real teaser. Makes me smile. I will make one out of orange for the CraftWear exhibit this summer, since this year's shade is Tangerine Tango. Now I just need to order more wire for I'm all out. The lamp is also new. After doing the huge copper knitted tube for a Florida rehab wall installation, I really wanted to explore the large scale knitted form, so I thought lamps would make a good vehicle to have a knitted skin over them. The original idea was to have a hanging lamp, but it wasn't practical, so I made a table lamp instead. It is pretty big, over 2 ft tall. I kinda ran out of ideas for a title and just called it Disco Lamp, for the shade does twinkle under the overhead lights. Nickel wire substructure, stainless steel lamp base with some red copper accents, and the shade is aluminum wire that I hand-hammered each loop, and trimmed with red copper wire. I will go back to the hanging lamp idea for my Living With Crafts submission for the Sunapee fair this summer. The earrings and necklace are all based on skeletal pod forms. Last Christmas, I had to do a rush job on a pair of custom earrings for a client, who gave me a sketch of what he wanted. Anyways, the dangly pod-like form stuck with me, and I decided to expand on that and take it further. I like the skeletal form, but added beads and more to them. I also tried a Celtic-like form where I take 3 long skinny teardrop links, solder them together so they look like a 3 point star, and then dome them into an elaborate teardrop form. I'm trying to get back to my architectural roots but still retain some fauna designs. One thing I learned, and every stonesetter should know that - double-check your cabochons before ordering bezel cups! I was going to use 50's Czech glass cabs in the necklace but I didn't check the size. The cabs were labeled 5mm but they were really 6mm, so I ended up using resin to add a little color to the necklace. It is called Buds to Blossom. The red beads are Czech glass beads from the 20's and 30's. I've been using a lot of vintage Czech glass this year.